So it looks like an error of the manual… I’ll fix it also… What kind of problem do you have with patch saving to the synth? New version updated (V.1.2.0). Have fun! Yes of course it works on Mac 🙂 Just download ctrlr and run it as standalone or as a vst in your daw. Once you have run Crtrl you can open the panel and use it. 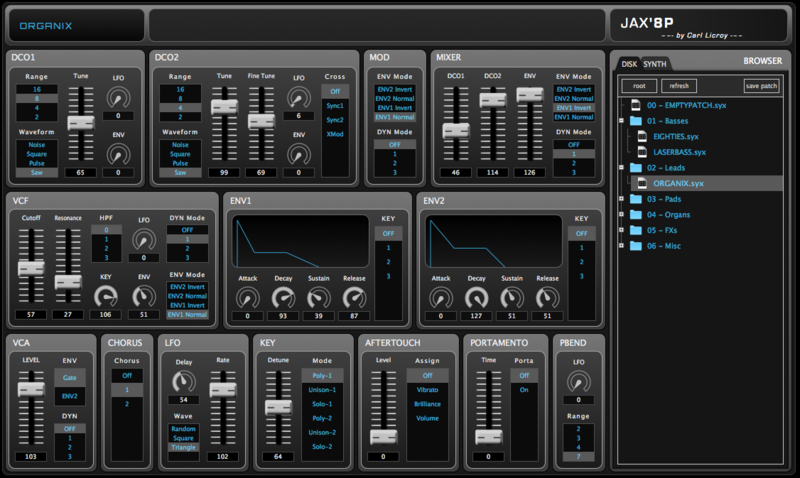 You can also export it as a vst when you have ctrlr running as a vst in your daw. Thank you in advance for your great work! Is there a tutorial where I can learn how to use this program? I can’t find the option “learn midi”, for exemple, so I can use the faders in my midi controller. Hi! I just found this great software…thanks a lot! (i’m really happy since sounddiver is no longer). How can i save patches on disk? When i hit save patch, nothing happens. Is there a way to backup soundbanks? Can you tell me how do I use this program? I’m running it as a VST in Logic Pro, but I’m a noob, I’ve just brought my JX-8P and apparently, I’m not able to configured to receive information from the vst, but the synth is playing the notes that I’m sending via midi through my Presonus Audiobox normally. I dont know how config in ableton live. Can you help me? First of all thank you! This looks like a dream come true to me with his patch management capability, way better than the editor that I own. BUT…well I can’t make it work. I set all midi channels to 5 (the channel I have on the JX) but when I move the sliders nothing happen, nor I can send any patch. Funny thing is, midi in works! If I change a patch on the JX it gets loaded inside the panel. Which is nice, but not the main reason why I’d like use this software. I can actually see the sysex data in the midi monitor , but it’s like they’re not transmitted to the midi out of my interface. Let me just point out that if I load my other editor it works, so it’s not a setting problem on the JX-8P.